Dyson Racing ran only one IMSA race in 1989 - at Lime Rock, the first Dyson race for John Paul Jr, - but other than that, they branched out to run a Champ Car for James Weaver. It was a short lived experiment as they found themselves on the outside looking in when it came to getting the equipment needed to be competitive. James's best race finish was an eleventh at Long Beach. 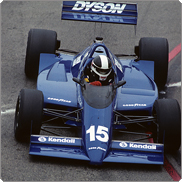 Rob Dyson: "We ran a Lola Indy Car for four races in 1989 and it was a learning experience. It is always good to expose the team to new disciplines. The Chevies had just come in and all the top teams had them and as the new kids on the block, you could not get them anywhere. So we went back to sports car racing in 1990 and started running the Porsches again."